Bank of Maharashtra offers education loans for Studies in India and Abroad. To be eligible for the loan, the students should be Indian national and have secured admission to professional / technical courses through Entrance test / Merit bases selection. Graduation courses/Colleges under Universities approved by UGC. Other courses leading to diploma / degree etc. conducted by colleges / universities approved by UGC / Govt. / AICTE / AIBMS / ICMR etc. Purchase of books/ equipments/ instruments etc. Travel expenses for studies abroad & other essential expenses. There is no margin up to Rs.4.00 lac. For loans above Rs.4.00 lac. Letter confirming admission to foreign university/ institutions. Brochure of the educational institution stating the amount of fees charged. Simple interest during moratorium period, there after compounded monthly. 1% interest concession may be provided to the loanees if the interest is serviced regularly as and when applied during the study period when repayment holiday is specified for interest/ repayment under the scheme. Interest concession is available only for moratorium period. 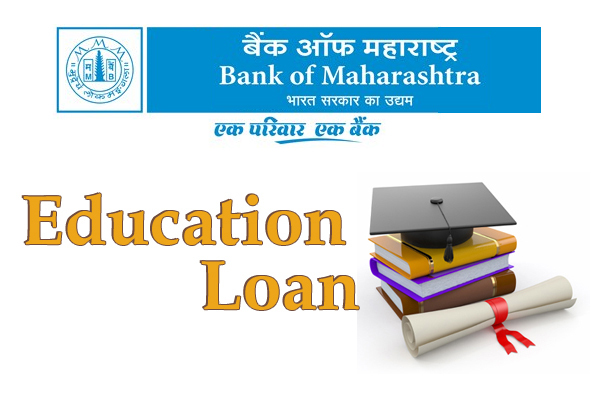 Student can apply education loan in online mode through the website of Bank of Maharashtra.